Set all targets in vertical position by levers located on the side of the game (Game 6 to 8 feet away). 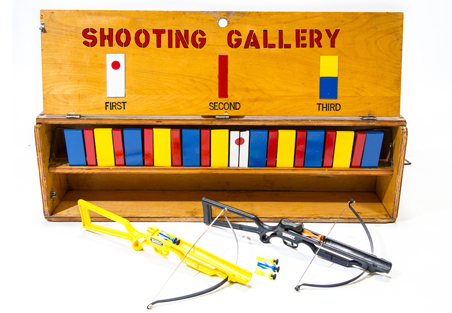 Player shoots until a target is knocked down. Both white targets of 1 bull’s-eye knocked down with one cork wins first prize. Red target knocked down wins second prize. Blue or yellow targets knocked down wins third prize. 1/2 of bull’s-eye or no targets wins consolation prize.